Two long fingers of nutty naughtiness! Chocolatey fingers packed with Roasted Peanuts in creamy soft chewy toffee, smothered in our dairy-free alternative to ‘milk’ chocolate. Sold as a 2 finger pack, 70g. For orders outside the UK, please email us. 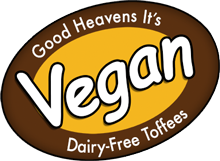 Unrefined Sugar, Glucose Syrup, Margarine (Sunflower Oil & Vegetable Oils), Roasted Peanuts, Soya Milk, Golden Syrup, Soya powder, Lecithin (Soya), Salt, Vanilla Extract. Chocolate contains 42% cocoa solids, sugar, cocoa butter, soya flour, sunflower lecithin.